With the spontaneous airport purchase of Digital Artist magazine and a fascination with doodling it was no surprise that the work of Matt Daniels aka StickyPop caught our eye. After the most random phone call from Lovelin we were pleased to have such a talented doodler onboard. I’m Matt Daniels, a self taught Graphic Designer and junior tattooer at Studio IX, Manchester. I’ve been a designer for almost 4 years professionally but it’s been 9 years since I first picked up Photoshop 7. I’m currently working at Studio IX as a junior tattooer - I’ve been tattooing now for about 7 months and love to do big bold, traditional style tattoos but I also have a huge passion for Pop Culture tattoos too. had a talent for art? As cliché as it sounds, I’ve been drawing since I was young. My Nana is a water colour painter and always sat with me drawing and painting - I guess this is where I started. Since then I’ve always just had a thing for drawing, whether it’s in my school books or on scraps of paper. It’s just something I’ve always done - I’m pretty rubbish at most other things like sports and reading/writing, so drawing is where I’m happiest. You have a signature style and get referred to as a ‘Super Doodler’. Do you think this name is fitting to your style? I’ve had a few ‘styles’ over the years, but the original style most people will know me for, especially the earlier days of drawing in shop windows or on bedroom walls, would be the ‘super doodler’ style. It was a very bold style of curvy lines and block colour to make characters and scenes that I thought up either on the spot or by taking influence from cartoons and animations that I love. The term ‘Super Doodler’ suggests you have an uncontrollable urge to doodle. What has been the weirdest thing you have doodled on? The weirdest thing I’ve doodled on would be the shop windows of the Noise Lab store on Market Street - probably the busiest street in Manchester. I spent 3 weekends painting and drawing loads of characters on bedroom furniture to create the display. It was a pretty surreal experience having people watching me, even sitting and eating their lunch on stools for a few hours or trying to communicate with me through the glass. Definitely a lot of fun. Mentioned in the last question you were involved in the Noise Festival. Can you tell us a little more about the work and how you found being trapped in a window display? I Originally Got Involved With Noise When I Saw Mr Scruff Do A Presentation One Evening Which Inspired Me To See If I Could Get Involved. I’ve Done A Lot With Them Over The Years From Window Displays To Skateboards, Shirt Designs And Even Talks In Front Of Hundreds Of People. The Shop Window Display Especially Was An Awesome Experience, One Which I’d Love To Do Again. You produced a tutorial for digital artist magazine. That must have been a great project to work on. Are you able to give us some more info on that project? Digital Artist was a great project to work on. I was lucky enough to feature in about 8 issues of the magazine with tutorials from creating Tilt Shift Photography to shirt designs and illustrations for band merchandise. I had so much freedom on the briefs as well which made it even more fun and relaxed. I’d love to do more magazine work when it's available. We have followed your work for a while and have seen you work with some great bands and produce some awesome work. Do you have a favorite project you have worked on? There are loads of fun projects that I’ve worked on but I think personally that working with one of my favourite bands, Letlive, was the highlight of my career so far. Speaking to the band about designs and what they like/don’t like was insane. They're a great band that I respect because of how down to earth they are, and I was super lucky to work with them. If you haven’t heard of them before, check them out. You seem to have made the transition from illustrator into tattoo artist. Was this always the plan? I got my first tattoo at 18 but it wasn't always the plan. I loved the idea of having pieces of artwork on your skin, but I never thought my style at the time would work as a tattoo. After drawing more and more, playing with new styles like dot work and mandala pieces I found I wanted to get into tattooing more, especially as by this time I’d gained a few more tattoos and was really keen on learning how to tattoo. I wish I started much younger because tattooing isn’t something you just do, it’s a serious skill and takes a lot of work. its hard to come by an apprenticeship too so it was only down to sheer luck that I got one. We At Lovelin Love The Design You Did For Our Campaign For Raising Awareness Of Homelessness. 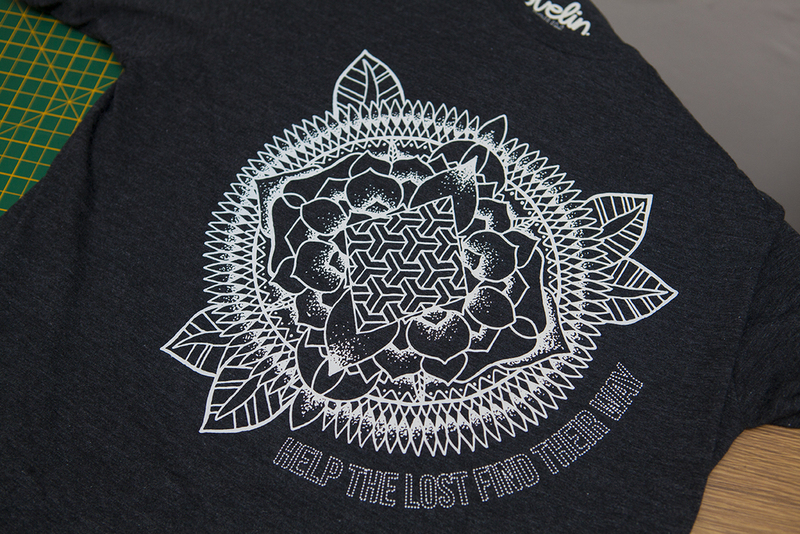 The design itself is based around a mandala but with some traditional styling and pattern work elements to it. I love patterns, especially the one you can see in the centre of the design. I wanted to make the design flower-like but still gave it traditional roots with the mandala, dot work and pattern work. Ending On A Silly Note, IF You Could Be Any Cartoon Character Who Would You Be? And Why? It has to be Earl of Lemongrab ; because anyone else would be unacceptable.